From David Everitt-Matthias' Essence: Recipes from Le Champignon Sauvage, an inspirational cookbook from the chef behind the restaurant that has been quietly revolutionising modern British cooking from sleepy Cheltenham. Unlike most restaurant cookbooks, the recipes from this highly original volume are very approachable - emphatically not because anything's been dumbed down for us home cooks all too often kindly presumed to be incapable of comprehending steps worded in sentences with more than two independent clauses, but because each complex recipe has been carefully broken down into the separate components, with detailed instructions on how to create each element, thus making the book especially appealing to the sort of home cook apt to deconstruct and mix-and-match as mood and resources dictate. Seamless, dissolve-on-tongue chocolate mousse. Chewy, salty, buttery caramel. Nostalgic, velvety, unmistakably malted ice cream. Crisp, crackling sesame wafer. Aside from being a combination of tastes and textures that a clunky string of adjectives really doesn't do justice to, what's really interesting is the method used to stabilise the olive oil (yes, olive oil) and bitter chocolate mixture. The trick is to proceed as if mounting a mayonnaise, thus giving the olive oil something to adhere to. The resulting texture is extraordinary, quite unlike your garden variety chocolate mousse, good as it may be. That said, what moved me off the sofa and towards the kitchen was not so much theoretically interesting technique, fascinating as it is, but good old greed - I have a huge weakness for salted caramel, and even on mere paper, this dessert promised to be a real winner. You've really outdone yourself....I might actually have to lick my computer screen. It looks irresistable!!! It looks so gorgeous!! Well anchored. funny you should mention those little delights...Michael Recchiuti a chocolatier based here in SF makes the most elegant sea salt caramels I've come across. who knew this combination could be so good! glad to see you posting again--life does get caught up to us doesn't it? and who wouldn't crave salted caramel? It is simply addictive. looks beautiful and delicious. i'm interested by the olive oil chocolate mousse, having recently fallen in love with olive oil ice cream served sprinkled with sea salt and drizzled with a particularly fruity oil. i'll have to try it! It seems to me as if I have to head to Kinukuniya again and get that book. This is something I have GOT to do. Ditto on the book, I am sold. That picture of the oozing caramel is practically pornographic. Am I the only person who salivates at the sight of gooey, oozing desserts? THIS is the most outrageous thing I've ever seen here or maybe ANYWHERE! I'm referring to the last picture of course. You have no pity J.
I haven't even read the post, just looked at the photos and all I can say is "Oh my God!" You always seem to make me want to go into my kitchen and bake something. I love this!! Beyond looking delicious, it is aestetically pleasing. I've been having a hard time deciding what to do for a dessert course on an upcoming dinner party, and the mousse looks perfect. Could you (please) part with the recipe? Thanks!!! You have the most marvelous knack of making your pastry look like timeless sculpture...I'm always thinking your creations ought to be in a gallery somewhere, not eaten! So intoxicating,mmmmmmmmm!! !Totally seductive post and pictures. what I like about your prose is that you sound tough, even thousands upon time zones away. I think we would get along in the kitchen. it helps that the phtographs are stunning and the plating is innovative but also straightforward. Thank you for reminding us to be smart and efficient and also leave room for for our own possible finesse. I love this book too, and have tried the recipe. The salted caramel is fabulous, but mine didn't turn out as runny as yours. That salted caramel looks divine! I need to look up the recipe, too..
Once more your product looks better than the books! wonderful amazing...can we get the recipe for the "mousse"
hi Jos! Can u recommend me a good ice cream maker for a small cafe? I don't bake, but your pictures alone make me drool and want to learn to do it some day.... looks delicious. This is really beautiful! 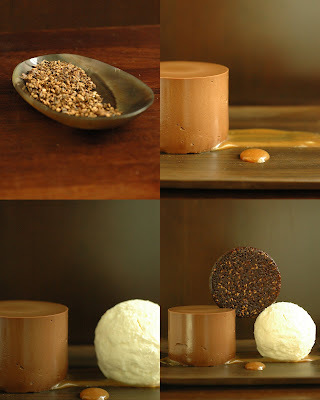 I'm familiar with the chocolate olive oil mousse from Spain; I'm curious how this is put together- You put the mousse into a mold, and insert the caramel in the center? What consistency is the caramel and how do you get it to ooze out like that? Very well done! we're suckers for salted caramel here too and that oozy caramel filling and very smooth chocolate mousse would go down a treat here. Hello. I just chanced upon your site today for the first time, & instantly thought 'wowza!'! Your photography is so sooo beautiful -- If only my photography was as good as yours... Puts my blog to shame! My new copy of Essence arrived today; David Everitt-Matthias has you to thank for the sale! I don't even have a sweet tooth but that looks amazing. Your photo's are mouth watering & I love anything caramel! Cheers!